We have child centric, activity based books to understand the depth of education and the subject. It can be very useful for the teachers and are a great source for teaching and learning in classrooms. ‘A poem is a performance’… each word has rhythm and sound. 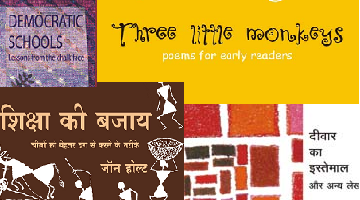 This collection of poems for early reader.. If there is one thing about schools that everyone agrees upon, it is that they should empower their .. Eminent historians explore some prevalent beliefs associated with Vedas: How Vedic are our religious..
विज्ञान की प्रकृति क्या है? शिक्षा में विज्ञान की भूमिका क्या है? विज्ञान शिक्षा की सही पद्ध्ति क्या..
Whaat is the money and what is its basic function? What is the fallacy of composition and why is ..